Eugene Bostick and his brother Corky are retired octogenarian who live on a farm by a dead-end street within the Fort Wort, Texas, city limits. Their property became a popular dumping ground for unwanted dogs over time, as their owners dropped them off behind the Bostick brothers’ horse barn to starve to death. The brothers made a home for them on their land, feeding them, letting them in and out of their farm house, getting them spayed and neutered if necessary and cared for by a veterinarian, and generally making the abandoned dogs part of an expanded, and still expanding, primarily canine family. The rescued dogs run around and play together on the farm, but Eugene had the inspiration to take them on local trips around Fort Worth, like to local golf course. Taking his design from a tractor he saw hooked up to individual wagons carrying rocks, he decided to build “the dog train.’” “I’m a pretty good welder, so I took these plastic barrels with holes cut in them, and put wheels under them and tied them together,” says the train’s main engineer. Now, a couple of times a week, Bostick loads up his dogs, all but the two smallest in their own compartments, and drives his charges through various Fort Worth locales. 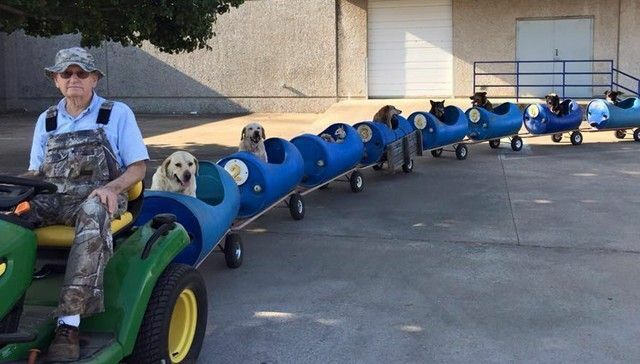 The dog train is a favorite photo subject for Fort Worth natives, and the dogs’ happy barking can be heard from quite a distance away. If only Amtrack was this much fun. This is a “Ha!” and a “Good for Them!” and an “Awwww” all in one choo-choo. I think they should get property-tax reductions for every dog they take in. Yep, sure is. But how long do you figure it’ll be before somebody starts a court action trying to ban these guys from their humanitarian behavior, because the possibility of dog poop on their immaculate golf course offends them? Or something else equally ridiculous. I’d also be willing to bet you that, when the suit is filed, the guy who files it will NOT be from Texas. Oh, for the days of Frontier Justice. “How much is that doggy behind the choo-choo?” Sorry, I couldn’t resist. To good to be true, but it is! Maybe I’ll drive over there today and look at the dogs. New hero! When I grow up and am 80, I want to be this guy! If I were the city council of Fort Worth, I would meet with this guy, make sure the dogs are well behaved, then give him a permit to do this to preempt the first person who calls the police on him. Maybe they could schedule him to visit children’s hospitals and schools? I hope Texas (and the rest of fly over country) never gets sophisticated. Or that this kind of loopy ingenuity becomes the new sophisticated. Wyo, sadly, there are a few places here that already like to think of themselves as ‘sophisticated’. Houston, Dallas, AUSTIN. Ft. Worth is NOT such a place. “The rescued dogs run around and play together on the farm, but Eugene had the inspiration to take them on local trips around Fort Worth, like to local golf course. Taking his design from a tractor he saw hooked up to individual wagons carrying rocks, he decided to build “the dog train.’” “I’m a pretty good welder, so I took these plastic barrels with holes cut in them, and put wheels under them and tied them together,” says the train’s main engineer. To nitpick (to Debbie Downer levels), I don’t know quite how extensive the “local trips around Fort Worth” is…. The golf course in question is literally this man’s backyard as the farm is immediately adjacent to the Sycamore Creek Golf Course. Not that what he is doing isn’t ethical…it is…I just don’t like stories blown out of proportion, no matter how good they are. Additionally, “the dogs’ happy barking can be heard from quite a distance away” could easily be translated into, “the only reason we found this guy is because the entire neighborhood has been complaining of barking during all hours of the night”. I just hope the same way he was discovered isn’t going to be the same way he get’s clobbered by some little local bureaucrat. Like I said, I think I’ll go check this guy out. By this account he certainly is a hero taking care of abandoned dogs (it’s also not the best part of town either – near the area of Fort Worth that gained the moniker “Little Chicago”). I just hope some busy-body doesn’t try to get him shut down. Ethics Alarms’ first investigative reporter!!!! Ha. Doubtful. I tried to find a sound clip of the frantic morse code signal you always heard before 1940s news flashes, but to no avail. To add on to the Debbie Downer comment, all this press really is going to lead to more irresponsible dog owners abandoning their pets at this farm. I grew up on a farm, and people constantly were dropping off cats and dogs — and that was without any coverage! On the flipside, I drove by there, and it was a depressing drive through an extremely run-down part of town…an exemplar of the broken-window phenomena. The derelicts wandering the streets there actually had me nervous at points. Then you finally get to a tiny little ok neighborhood tucked away that these brothers live in…. so maybe, too many irresponsible dog owners won’t even brave the trek through Little Chicago to dump their dogs. I was nervous enough to… “elevate my readiness posture”, to use a euphemism. Locked your doors, I hope. That should be interpreted as saying “I don’t like details exaggerated in stories, no matter how good they are”…I do think good stories SHOULD be MORE emphasized and MORE publicized than they are. Crap — should have kept reading. I agree. This is the sort of person that life is trying to mold us into, if we allow it. When I was younger, I was indifferent towards animals and children. As I got older, adversity gave me a great deal more empathy, and I began to really appreciate how beautiful and innocent these creatures are. My wife played a big role in this. She loves cats, and as my love for her grew, my appreciation for all the things she loves grew. Before I met her I had no use for cats. Funny how that works. People like this man are our best hope for evolving beyond the need to constantly kill each other. I can’t believe that I’m first reading this excellent and heartwarming story from Texas on THIS website! What the hell is THAT supposed to mean??? This is the first place I saw the story also and I’m FROM Fort Worth. Means the local news barely covered it and SMP is a Houstonian. Of course it is just an awwww factor story. Not like SMP should expect non local coverage. I was referring to the upper case THIS. THIS blog covers ethics stories, good and bad, whenever and wherever they occur, “THIS” implies some anti-Texas animus which simply doesn’t exist, and I don’t care for the innuendo. Texas may be the most quintessential American state of all—a microcosm, and a good one. He should’ve capitalized “I’M” or “FIRST” instead. And ye don’t stink of mutton. And you’ve ditched those shrieking bagpipes! I sure know how to raise a fuss, don’t I! Hasn’t made the Express-News or any T.V. station in San Antonio, either. Well, it wasn’t exactly the moon landing. Nope, true. Human interest, no more.